Traveling from place to place within Taiwan’s towns and cities varies in difficulty depending on where you are. The bigger the city, the easier it is to get around. So, while people who don’t speak any Chinese shouldn’t have too much trouble navigating Taipei, smaller towns might be more problematic. If you’re in Taipei, one of the most convenient modes of transport is the MRT (Mass Rapid Transit). The system is wide ranging, extremely clean, and very cheap. Trains stop at many locations around the city and even travel out to tourist destinations such as the Taipei Zoo, Danshui 淡水, and Beitou 北投. Single trips cost between NT$20 and NT$65, but regular travelers can also buy oneday tickets or invest in an EasyCard. 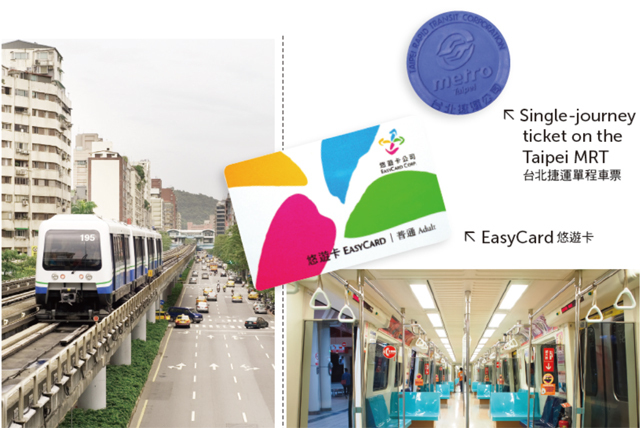 This is a stored-value card, and it can be used to pay for MRT, bus, and some train trips in and around Taipei. Many shops, especially convenience stores, and even some taxi drivers will accept payments made with an EasyCard. Taipei’s bus network reaches even more places, and service on most routes runs very regularly. Another great thing about buses in Taipei is that many of them have LED signs that show what the next stop will be in English and Chinese. Fares are usually very low, but some vehicles can get very crowded. If you’re unsure about what bus to take or just want a little more comfort and privacy, it’s easy to get a taxi in Taipei. There are taxis lined up outside most train and MRT stations and many more can be found driving along the busy roads in the city. Kaohsiung also has an MRT system, and tickets are similar in price to the ones in Taipei. Travelers can buy one-day, two-day, or even 100-day tickets, or theycan purchase the Kaohsiung stored value card, which can also be used on the city’s buses and ferries. Kaohsiung’s MRT system isn’t as extensive as the one in Taipei, but more lines are planned for the future. A lot of buses run through the city, and the main bus terminal is located directly outside the train station. An MRT system is also being built in central Taiwan’s Taichung City 台中市. In fact, the network might eventually stretch to the nearby cities of Changhua 彰化 and Nantou 南投. Bus service here and in other places around the country is not as frequent or well developed as it is in Taipei and Kaohsiung. People in Taiwan’s smaller cities rely on taxis or their own transport. Scooters can be rented in most towns, and rental centers are usually located near train stations. However, you should only ride a scooter if you have a license. If not, a bicycle is a safer option. Cycling is very popular in Taiwan. Even in big cities, people sometimes pedal to school or work. If all else fails, you can always walk. The only problem is that many streets, especially in smaller towns, don’t have sidewalks, so be careful!